Have you ever wondered what it would be like to be a policeman or woman? You’d spend your days solving crimes and protecting people. Of course, you’d have a partner to help you and maybe, that partner would be a dog. 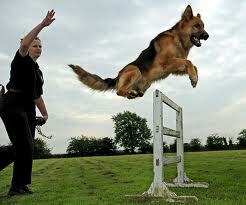 Police dogs go through extensive training. Getting and training a dog can cost as much as $8,000. Read on for more all about police dogs. European police departments started using bloodhounds to sniff out criminals more than 200 years ago. Dogs were used in World War 1 and 2. After the wars, police departments in America started using these brave, smart dogs. Trainers train police dogs through games. A police dog’s nose is about 50 times more sensitive than a human’s. Police dogs can sniff out drugs, bombs or weapons that humans can’t find. Sometimes police dogs can stop a criminal just by intimidation. A low growl or a bark from a fierce police dog is pretty scary. Not every dog can be a police dog. Can you imagine a beagle or a Yorkshire terrier trying to intimidate a criminal? Most police dogs are male German Shepherds. These dogs are smart, aggressive and strong. Police dogs go through extensive training. Getting and training a dog can cost as much as $8,000. Only the best police officers are allowed to have dog partners. They are called K-9 officers and they stay with the dog until the dog retires. It was in Belgium in 1899 that police dogs first began active duty in organized programs. A video footage of how police dogs are trained. 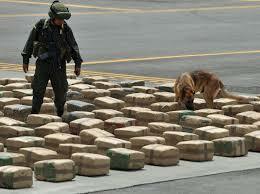 Question: How do trainers train police dogs to sniff out drugs? Answer: Through games. Police dogs love to play tug-of-war with an old towel. The police trainers hide drugs or other items. Once the dogs find these items, they get to play. 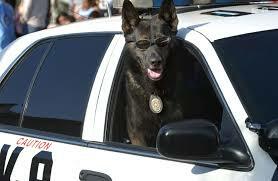 Question: Where do police dogs live? Answer: They live with their police partners. Question: Are there special types of police dogs? Answer: Some dogs are trained in finding bombs, while others track people. Beagles are sometimes trained to sniff out vegetables in people’s suitcases at the airport. There are even search and rescue dogs that look for missing or hurt people. Enjoyed the Easy Science for Kids Website all about Police Dogs info? Take the FREE & fun Police Dogs quiz and download FREE Police Dogs worksheet for kids. For lengthy info click here. Declan, Tobin. " Fun Police Dog Facts for Kids ." Easy Science for Kids, Apr 2019. Web. 20 Apr 2019. < https://easyscienceforkids.com/all-about-police-dogs/ >.